A lot of people, via emails, letters and phone calls, have been asking me how I can be so pessimist about consumption growth in China given the spectacular consumption growth figures coming out of China – 15.4% year to date. An editor who asked me for a piece, after reading it also wondered if my view – that China’s GDP growth would be constrained by its consumption growth – was such a worrying thing given China’s 15% growth rate of consumption. The problem is that these are not consumption growth figures. They are retail sales figures. Fair enough, you might think, but the retail sales growth rate should still be a reasonable proxy for consumption growth. It isn’t. Among lots of other noise retail sales figures include government purchases and shipments to retailers even before these shipments are sold to consumers. That makes it a very bad proxy for consumption. Take a look why. I took the following chart from the September 14 issue of Jim Walker’s excellent Asianomics report. This shows retail sales for the past decade. 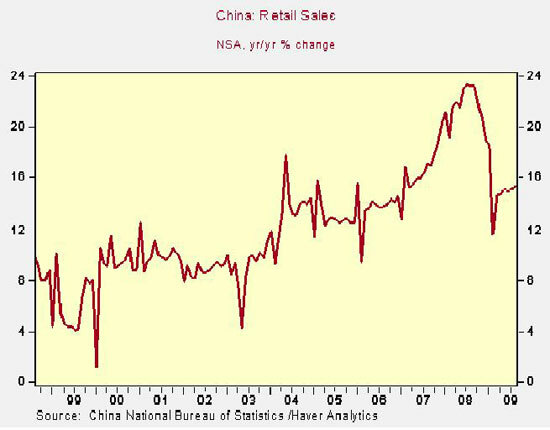 As you can see, first of all for all the excitement there has not been much of a surge in retail sales. Secondly, retail sales have been supposedly growing between 13% and 24% for the past six years, which even on an inflation-adjusted basis (I assume it is inflation that explains the late 2007 and early 2008 surge) significantly exceeds GDP growth. But if retail sales were really a decent proxy for consumption growth, it would be hard to tell from this graph that consumption has plunged as a share of GDP. But it has. Consumption has been growing over the past several years by about 8-9% a year, while GDP has been hurtling forward by 10-12% a year and, not surprisingly, this implies arithmetically that consumption is declining as a share of GDP. This is supposed to be a short entry, but before closing I should discuss the recent 35% tariffs on Chinese tires imposed by the Obama administration, especially since that seems to have been one of the hottest topics of conversation today. For nearly two years I have been arguing that the global crisis is a two-step crisis in which, as the first step, the low-saving trade-deficit countries would see an interruption in their ability to finance their consumption. The second step would see the impact of the crisis spread to the high-savings trade-surplus countries, which were ultimately more vulnerable to a contraction in global consumption. This spreading out would almost automatically involve, as it always has in the past, a sharp contraction in international trade and a rise in trade tensions, as the trade surplus countries responded to the contraction in external net demand by self-defensively trying to improve their ability to export excess capacity (as in Smoot-Hawley in 1930). But this effort is doomed to failure. Collapsing trade deficits require collapsing trade surpluses. For me the tire dispute is par for the course and not a surprise. US labor unions are angry that China’s cheap exchange rate and its interest rate and other subsidies to manufacturers effectively act as tariffs on imports and subsidies on exports, especially since the stimulus package seems to have added capacity unnecessarily. China is angry that the US is imposing tariffs on its products, and wants to retaliate. This is a dialogue of the deaf. Many in China seem completely incapable of understanding why what it considers as purely “domestic” issues (even the currency is considered a domestic issue) should have anything to do with trade. Many in the US see China cheating in fact but not in form, and cannot understand how slow and how difficult it will be for China to retool its economy and remove its implicit subsidies and taxes. Most of the press focus is on US-China disputes, and the truth is that these matter a lot because this is the most important trade relationship, but trade-surplus countries are in disputes almost everywhere. This, in my opinion, is only likely to continue. I suspect that we will make a concerted effort to coordinate the adjustment process only after things have gotten much worse for everybody.